I don't like watching many sporting events but the Americas' Cup is one of them. Actually I'm less interested in the sport and more interested in the technology which seems to change at a quick pace. The NY Times has a nice story on the two current contenders and a great slide show as well. Check that picture out on the right. Those are outrageous main sails. The BMW Oracle boat seems particularly innovative. More about the boat here. 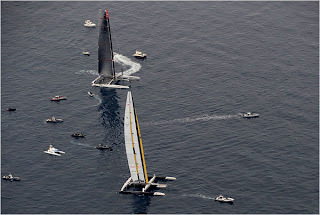 The race is just starting now and is currently on hold because of poor wind conditions. It looks like the first race will happen on Wednesday (3:45AM for you east coasters). Supposedly you can view it on ESPN360.